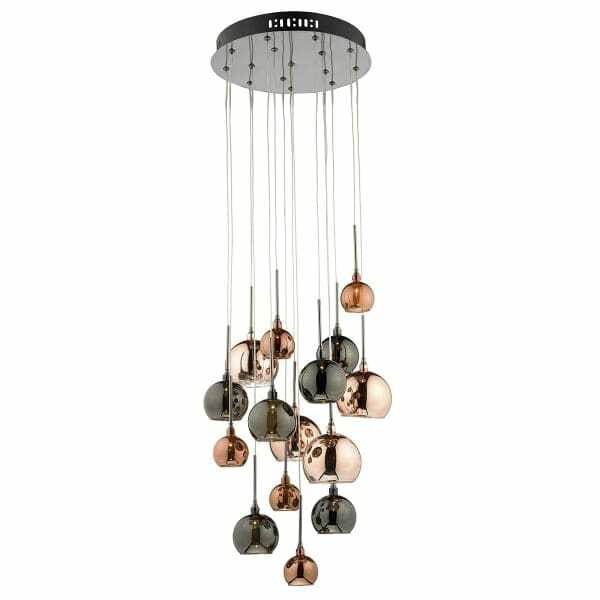 A stunning 15 light ceiling cluster pendant with beautiful high shine electro plated glass open bottom globes in cascading shades of copper, dark copper and black. Ideal for lighting in rooms with medium to high ceilings and great for long drop stairwells or over dining room tables. Add intrigue and elegance to your contemporary interiors. Here at The Lighting Company we have a large and ever growing range of lighting to suit every setting. Browse the full range of ceiling pendant clusters here: Ceiling Pendant Clusters.